Rozine Moughalian is a 56 year old mother of two from Bourj Hammoud and if she doesn’t get a liver transplant within a month, Rozine will be no more. This is as simple as that statement could be formulated. Over the past three months, Mrs. Moughalian developed subacute liver failure. Doctors have not yet been able to identify a cause but her condition has deteriorated so fast that the only cure for her is a liver transplant operation, one that no hospitals in Lebanon can do. As such, in order to save her life, Rozine’s Moughalian’s daughter, Catherine, turned to the only entity that she knew had the power to save her mother: us. This is not the time to disappoint. We have less than 10 days to raise the required hefty amount to ensure that Mrs. Moughalian is covered for the operation and all its associated expenses. I believe we can do this. A couple of years ago, we all got together and pitched in to give my friend Simon a fighting chance at beating his leukemia. Let’s do the same for Rozine, a psychologist and a mother, who still has plenty to give to her family, her country and herself. We should not let Rozine be the victim of the Lebanese condition, where only those who are rich enough can access healthcare while those who can’t pay up wait for their souls to be reaped. This is not how things should be and we should not allow it. Minister Wael Faour, if you or your people happen to read this, it is your duty as a minister of health to make sure that citizens like Rozine, who at times like these need governmental assistance the most, to get it and have a fighting chance at life. This is as important as ensuring coverage for those above 64 years of age. My mom, Rozine Moughalian, is a 56 year-old psychologist and mother of two. She lives in Bourj Hammoud, an area that has been recently piled with garbage and darkened by black smoke from burning trash. In the last three months, my mom developed subacute liver failure, which doctors were unable to diagnose and suspect possible drug or toxin exposure. The condition developed quickly, and mom went from working three jobs two months ago to being hospitalized with a terminal condition today. She is currently in need of a liver transplant without delay (within the next two weeks). It is an extremely difficult process to find donors and secure funds in such a short period of time. So, due to bureaucratic procedures and time constraints, she can’t receive a liver transplant in Lebanon and it was recommended by doctors that she be transferred abroad for proper assessment and treatment. We are currently aiming for transferring her to Iran or India, these being the cheapest options. France was also an option earlier but it costs double what the surgery would cost in Iran or India. Mom does not have the money for such a surgery, and she doesn’t have access to free quality healthcare. We need to raise at least 200,000 USD by the end of the month to be able to fund her surgery or it will be too late. In a country where our basic rights are not available, or only available to a select few, sticking together is more of a basic need than duty. If you feel you can donate, any amount will bring us closer to the goal of keeping my mom alive. I understand if you can’t donate, but please share this message with people who you think can help, either financially or by pointing us to people who have had a similar experience and can help with procedures and logistics. I urge you to gather your resources as I am gathering mine. Thank you for reading this. 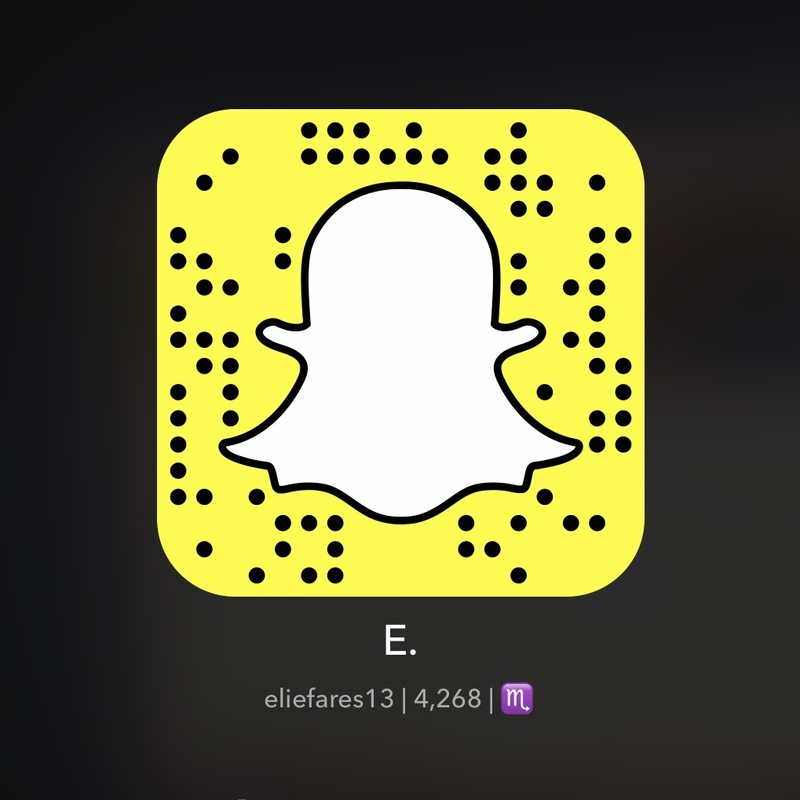 Posted on April 3, 2015 by eliefares Tagged charitycystic fibrosisdiseaseFundraisingLebanonNibale	Comments5 Comments on Help Out 23 Year Old Nibale Beat Cystic Fibrosis! Help Out 23 Year Old Nibale Beat Cystic Fibrosis! 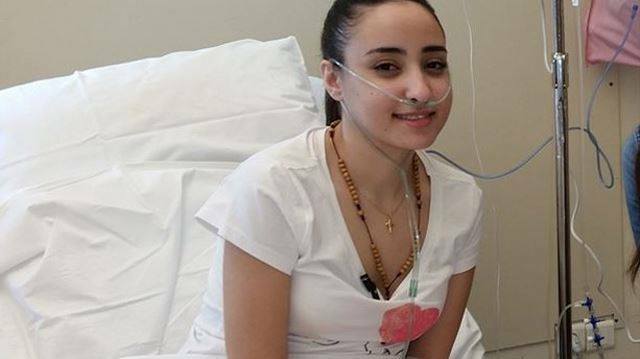 Nibale is a 23 year old Lebanese girl who has been suffering from cystic fibrosis since she was a child. For those who don’t know, cystic fibrosis is a very challenging disease that manifests through repeated lung infections, insufficiency of the pancreas along with a ton of associated complications (medical link). Patients who have the disease end up literally suffocating to death. Nibale is fast approaching that point. She is at terminal stages of the illness where medical therapy doesn’t work anymore. What Nibale needs now is a lung transplant, which is an operation that costs more than 300,000 euros. Her family doesn’t have that amount, which is why I think we should all mobilize to help. We’ve all proven that when we can as an online community and as Lebanese, helping out people to try and beat illnesses when the only hurdle is money is entirely possible. We raised the money for Simon when he was fighting leukemia, a fight that he ultimately did not win but he got a fighting chance because of us anyway. We raised the money for Carina Aoun in her attempt at helping out Palestinian children in a mental health project. Today, Nibale’s life rests in our hands. We are the only chance she has. Given that it’s Easter time, the sensible thing to do would be to help. That would be an act of goodness that actually counts, far more than going to 7 churches and attending all-nighters prayer sessions or even praying 5 times a day. Contact +9619658658 or +9619850850; ext : 1130 – 1131 if you can donate. Or email menelaleb@lbci.com with your name, phone number and amount you’d be willing to donate. I was walking around Beirut the other day, in neighborhoods I hadn’t been to in a long time, only to find streets that have drastically changed. The most poignant moment of my walk was when I saw an old woman, sitting by the corner of the road crying. She had her mattress next to her. She had nowhere to go. The walk up to that woman was full of people like her. Things are getting tougher and there’s nothing to make them easier. As a rule of thumb, it can be said that Lebanese restaurants are very disassociated with the general security of the country. As things get tougher, their prices get higher. I’ve rarely, if ever, heard of stories like the one below. But it is one of those rare instances that take you a few minutes to believe. Of course, Zaatar w Zeit didn’t advertise this. It was simply an act of kindness on behalf of their branch in question. 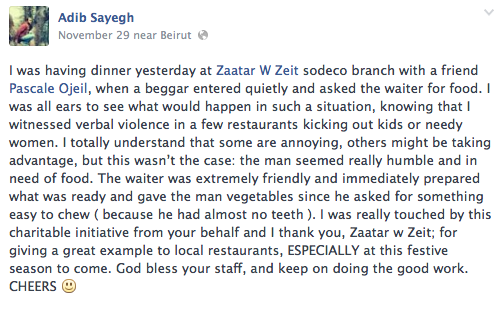 We all barraged Zaatar w Zeit for not serving alcohol at one of their branches this past year. It only felt fitting to highlight an act of kindness on their behalf towards those who are less fortunate in the midst of this non-festive holiday season. 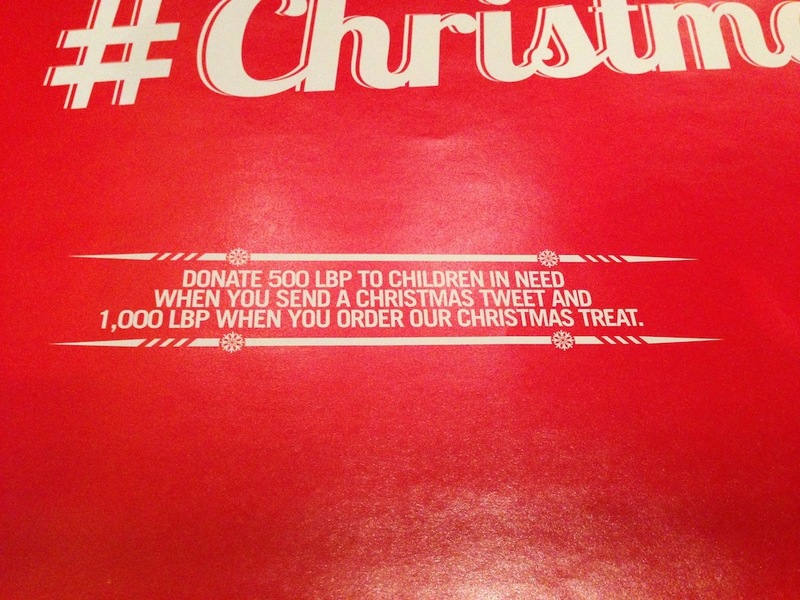 Great job Zaatar w Zeit. Hopefully other restaurants follow suit in trying to make things easier for those who are overwhelmed by the harsh conditions of life in Lebanon. I went with a couple of friends to Crepaway yesterday and figured their new sous-plat is worth sharing with you. 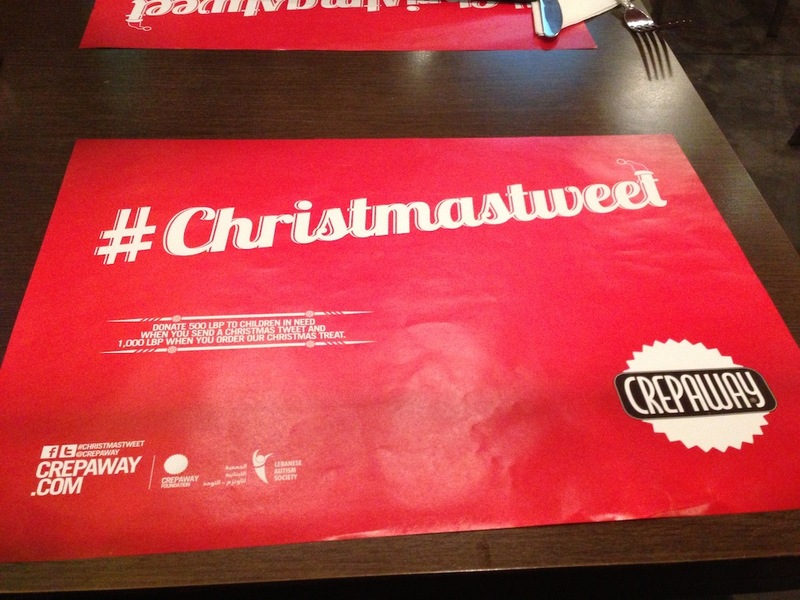 For this year’s Christmas season, Crepaway is donating 500LL (33 cents for my International readers) for every tweet containing the hashtag #ChristmasTweet with the mention of Crepaway. All proceeds will go to the Lebanese Autism Society, a charity supporting a cause that many in Lebanon don’t speak about. You can also order their Christmas Treat dessert which costs about 19,000 out of which 1,000 will be donated to charity. I made the post’s title as the hashtag to be tweeted on purpose. Every time you share this article on twitter, you will be donating. Give back this Christmas season. All it takes is a click. Lastly, I would like to thank Crepaway for the awesome gesture and I hope other restaurants follow suit in using Twitter and other platforms to spread awareness to certain causes and tangibly help them.